Black Snake Productions provides wildlife incursions for children of all ages through various kinder and school presentations. 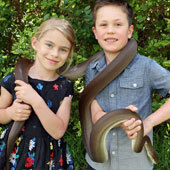 By doing this, Black Snake gives kids a hands-on experience with a wide assortment of wild creatures that live here in Australia. The children are able to observe, hold and touch the animals and also learn information about their characteristics and habitats through these one-hour presentations. This wildlife education group has been offering this interactive education on these animals for over 10 years to further the conservation efforts with Australia’s vast array of wildlife. For young children to mature into adults who care about this country’s wildlife, they must interact with the animals whenever possible to learn all the wondrous facts and characteristics about them. Only by doing this, will they develop a compassionate feeling for these creatures that will also foster the desire to protect the animals for generations to come. • Bushland Biodiversity – In this presentation, the children will learn about animals in the Australian bush, such as marsupials, birds, frogs, reptiles and invertebrates. The lecture covers topics ranging from adaptation to the effect of humans on their habitats. Minibeasts – The focus of this presentation is on the smaller animals in our Australian ecosystem and their importance to it. Examples of the animals include native rodents, frogs, giant crayfish, spiders, small reptiles and other creatures. Tooth and Talons – With this presentation, Black Snake talks about the fascinating Australian predators, such as centipedes, death adders, pythons, scorpions, birds of prey and others. Australia’s Amazing Reptiles – The educational experience of this presentation focuses on the wide assortment of reptiles in this country ranging from non-venomous snakes to crocodiles. Australia’s Vanishing Species – This presentation examines the struggles of many of our native species, including painted turtles, masked owls, bush curlews, rough-scaled pythons and more. Snake Safety – This presentation speaks about snake identification, the reasons people are bitten by snakes, the importance of snakes to our environment, snake safety practices and first aid to treat snake bites. Non-venomous snakes will be on display for the children to touch or hold. To learn further details about the school incursions by Blacksnake Productions to provide children with an interactive animal learning experience, contact us at your earliest convenience. We will provide you with a free quote of our services.